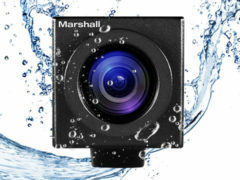 Our FiOPS upgrade includes the new Marshall CV502-WPMB camera. Admiral Video is pleased to announce the upgrade of our FiOPS Fiber-Optic POV Camera Systems, which now include a waterproof camera and a touchscreen FiOPS Tablet Controller. Our first-generation FiOPS POV systems have been in use by a multitude of clients, including major networks, since they were introduced two years ago, and we have worked hard to provide additional value to our clients with this upgrade. The first component of the upgrade is the new Marshall CV502-WPMB camera, which is IP67-rated – meaning it is submersible in water up to 1m/3.3′ and totally protected against dust, dirt, and sand. This eliminates the need for rain covers and opens up new possibilities for mounting locations. We have developed custom parts to allow our broad selection of lenses, from “super-wide” to “tight,” to be used while maintaining the waterproof rating. Optionally available ND filters that are field-swappable allow for improved image quality in challenging lighting conditions. Our FiOPS Tablet Controller is right at home in the video pit. The second component of the upgrade is our brand-new FiOPS Tablet Controller. 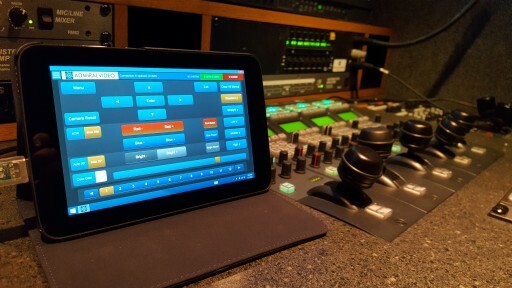 Using custom software developed in-house and running on a touchscreen tablet computer, the Tablet Controller provides for remote control of Exposure, White Balance, Color Gain, and Gamma with a simple interface that provides visual feedback without using the camera’s OSD menus. The unified interface simplifies multi-camera operation (up to 12 cameras). These upgrades come alongside our same tough, integrated fiber system, still requiring just one strand of fiber per camera and with a single power supply for both the transmitter and the camera, allowing us to maintain the existing ease of use, reliability, and short setup times that our FiOPS systems are known for. For more information on our upgraded FiOPS Fiber-Optic POV Camera Systems, please see our information page or contact us today.